Fridge Sticker Cactus pattern in watercolor style. Fridge Sticker Abstract retro 80s background with geometric shapes and pattern. Material design wallpaper. Fridge Sticker Hand drawn seamless pattern with brush strokes in pastel colors. Fridge Sticker Hand drawn seamless pattern with brush strokes and geometric figure. Fridge Sticker Watercolor tropical palm leaves seamless pattern. Vector illustration. In modern apartment design, wrapping furniture with stickers is becoming increasingly popular. With this trend, an ordinary fridge can look as if it was made from a different material, like wood. But that's not the end of the possibilities… you can make your fridge look as if it was a Marshall amplification unit or a London telephone booth. 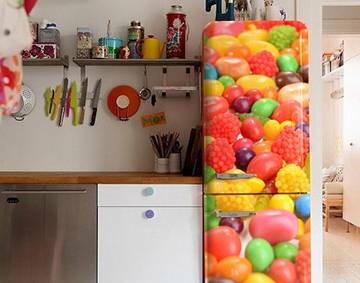 Give a new dimension to your entire kitchen with a 3D fridge sticker. Fridge Sticker Geometric memphis background.Retro design for invitation, business card, poster or banner. Fridge Sticker Seamless retro geometric pattern. Fridge Sticker Seamless pattern with ginkgo leaves. Fridge Sticker Seamless pattern with tropical birds. Fridge Sticker Palm leaves silhouette on the white background. Vector seamless pattern with tropical plants. Fridge Sticker Damask seamless pattern background in pastel pink. Fridge Sticker Seamless pattern of cocoa beans. There can only be one answer to this question, and it’s very simple: yes. Created with the use of the most modern materials, all fridge stickers are custom-made to smoothly adhere to the surface of a fridge and not peel back at the corners. You can be sure that your piece of furniture will be beautified and not the contrary. You also don’t have to worry about smudges or dirt, as the stickers can be cleaned. In fact, a covered fridge might even be easier to clean than an uncovered one. With stickers, you can regularly change the look of this appliance without dragging it out of your apartment – changing a sticker is very simple and won’t take much effort at all. A fridge sticker is perfect for all those who can't stand monotony in their apartments but are not sure whether such a large and visible change like a wall mural would work. The fridge is a place that will undoubtedly stand out, but the transformation of your room won't be as dramatic as in the case of a wall mural. You might think that the most frequently purchased fridge stickers would be "safe" patterns, such as imitation wood paneling or single-color sheets, consistent with the rest of the furniture. Nothing could be further from the truth. It's contrasting motifs of vivid colors that are most frequently ordered, like landmarks and monuments (e.g. a London fridge sticker with the famous red telephone booth), flowers (lavender fridge sticker) or photos of animals. If you want to make your kitchen cozier, it's worth considering fridge stickers depicting fruit or a cup of coffee. If you want to make the design of your kitchen cohesive and make it so the fridge doesn't stand out from the rest of your furniture, it’s good to pick a material that matches the convention of the room. Now, all that's left is to choose. Whatever you select, you can be sure that your kitchen will change beyond recognition. Fridge stickers are not only a decorative accessory, they also make for great protection against smudges, dirt and small scratches. They can hide blemishes and make an old, worn fridge look new. Consider applying stickers to your fridge if you'd like it to be easier to clean.